To understand if a lagotto Romagnolo has morphological and characteristic characteristics typical of the breed, we must refer to the standard Enci-FCI. 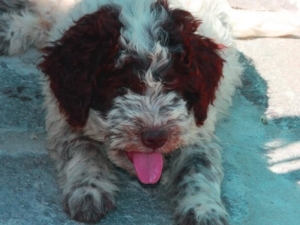 The Standard 325/bis defines the characteristics of the Lagotto Romagnolo. 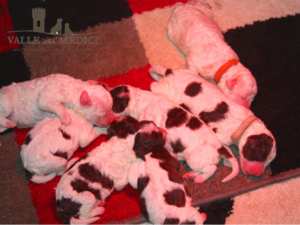 Lagotto Romagnolo is an internationally recognized Italian breed dog. It was the 10 Mazo 1995 when it was awarded the recognition by the FCI and its translations of the standard in German, Spanish, French and English. Origin: Italy use: Dog specialised in the search for truffles on any type of land classification FCI: Group 8 carrying dogs, search dogs and water. SEZ 3 Water Dogs Short Historical notes: Ancient breed in water present since the sixteenth century in the valleys of Comacchio and in the lagoons Ravenna and then diffused, from the end of the nineteenth century, in the plains and hills of Romagna with the precise function of dog D To truffles. General aspect: The Lagotto Romagnolo is a medium-small mole dog, of rustic appearance, strongly built and very well proportioned, with dense and curly hair with woolly texture. The general conformation is that of a slight mesomorph whose trunk is in the square, harmonic with respect to the size (heterometrics) and didymonic with respect to the profiles (alloidism). Important proportions: The length of the head reaches the 4/10 of the height at the withers. The muzzle length is less than 2/10 compared to the length of the skull (i.e. the muzzle is about 44% of the total length of the head). The height of the side is somewhat less than 50% of the height at the withers and may touch 44% of this height. Behavior and Character: the function of Lagotto Romagnolo consists in the search for truffles, a work that carries out with passion and efficiency exploiting its innate aptitude for search and excellent smell. Having erased the hunting instinct, in his work is not distracted by the wild and can be considered the only real specialist for the search for truffles. Sober, intelligent, affectionate, highly attached to the master and easily trainable, the Lagotto Romagnolo is also an excellent dog and pet. Moderately massive and trapezoidal in shape seen from above, it has the upper longitudinal axes of the skull and muzzle among them slightly divergent. Its length reaches 4/10 height at the withers. The cephalic index ranges from 50 to 54. The skin is adherent to the underlying tissues, smooth and taut. Skull region: The skull is wide to the cheekhead. Its length corresponds to 56% of the total length of the head and the width (bizygomatic diameter) is equal to the length. Seen in front looks arched. Profile forms a very open arch that attenuates in the occipital region. Frontal breasts well developed in the three dimensions, marked supracciliary arches, nasal-frontal depression (stop) not too accentuated but evident, pronounced medium-frontal sulcus, short and relatively depressed occipital ridge, were over-orbital ( fontanelles) slightly marked. Truffle: Voluminous, with very wide nostrils, open and mobile. Very pronounced median groove. In profile It is on the same line of the nasal barrel and protrudes imperceptibly on the anterior face of the jaws lips: well developed. The branches of the mandible are quite straight and the mandibular body is strong and relatively wide. The teeth are white, complete for development and number, with a scissor or pincer incisors, tolerated the reversed scissor (antiversion of the lower incisors). Cheeks: Flat masseters. Eyes: Large, rounded and slightly outcrop. The color of the iris goes from the ochre to dark hazelnut and brown depending on the mantle. Sub-frontal positions have adherent eyelids with pigmented margins in the different shades of brown. Extremely developed lashes. Attentive, intelligent and vivacious expression. Ears: Moderately large in relation to the head volume, with slightly rounded apices. Triangular-shaped with a rather wide base, attached just above the zygomatic arch, resting pendants at rest or slightly detected in attention. If stretched, they reach the nasal barrel at 1/4 of its length. The fur on the ears tends to open the hedgehog while keeping himself always well moved. There is no portion of ear with short hair. The inside of the headset is covered with hairs. slightly arched upper. Absolutely no deerthe. Just shorter than the head (8.5/10 of the total length of the head), has a perimeter that can reach, in males, double its length. Strong, muscular, dry, oval section, with good detachment from the back of the neck. Cost: Well developed. Descended to the elbow, its perimeter exceeds 1/5 the height with the withers, its transverse diameter, which is maximum at half of the thoracic height, it touches 31% of the height with the withers, its depth reaches 54% of the height with the withers, its height touches the 44% Height at the withers. Before it presents a very slight hint of fairing and then widen considerably backwards starting from the sixth coast. Bottom line: The sternum-ventral profile shows a long sternal region which, tending to the straight line in a first short section, then continues in a very large semicircle with a very wide rope, gently rising towards the abdomen that is not too retracted. Inserted at half-height, tapered at the tip, if stretched it touches the hock. It is covered with woolly and shaggy hair. Brought to Scimitar in repose, he rises decidedly in attention. In work or when the dog is excited can also be brought considerably raised on the back line, but never curved ring. General examination: Regular Appiombi both in profile and in front. The height of the limbs at the elbow borders 56% of the height at the withers. Shoulder: Long (reaches 30% of the height at the withers), oblique (52 °/55 °), muscular, strong, adherent to the thorax but free in movements. The scapulohumomal angle oscillates between 110 ° and 115 °. Arm: Muscular, of dry skeleton, its length corresponds to 30% of the height to the withers. Its inclination on the horizon varies from 58 ° to 60 °. Forearm: Perfectly vertical, oval section, with compact frame. Its length corresponds to 36% of the height at the withers. Elbows: Long, prominent, well adherent but not tightened to the side, covered with dry skin, must lie like the omeres on a plane strictly parallel to the sagittal one of the trunk. The tip of the elbow (Olecranic epiphyses) is located on the vertical lowered from the caudal angle of the scapula to the ground. Carpo: Seen in front follows the vertical line of the forearm. It is dry, thick and mobile. The pisiform bone is well protruding. Metacarpus: of thickness rather inferior to the forearm, it is dry, elastic, with minimal subcutaneous cellular tissue. Seen in front of his direction must be on the same vertical plane through the forearm, seen in profile form an angle with the ground di75 °/80 °. Foot: Rounded front feet, compact and with arched fingers and gathered. Strong and curved nails. Good pigmentation of the orthotics and digital bearings. Very developed interdigital membrane. Overall judgement: Regular Appiombi, powerful rear train and well-represented to the mole of the dog. Thigh: Long (up to 35% of the height at the withers), with well highlighted and clearly divided muscles, it has a slight posterior convexity. The axis of the femur, somewhat oblique from top to bottom and backward forward, has an inclination of 80 ° on the horizontal, the coxo-femoral angle is therefore about 105/110 °. The vertical plane passing through the thigh, in relation to the median plane of the body, is parallel. Leg: A little longer than the thigh (about 36% of the height at the withers), with good bone and musculature, the groove is well highlighted. Its inclination on the horizontal ranges from 50 ° to 55 ° with a patellofemoral-tibial angle of about 130/135 °. Its direction is parallel to the median plane of the body. Hock: wide, thick, dry, with well-highlighted bony saliences, parallel with respect to the median plane of the body. The Tibio-metatarsal angle is about 140 °. Metatarsal: dry, cylindrical, always perpendicular to the ground. Foot: Hind feet slightly more ovaleggianti than the front and with a slightly less arched phalanges. Ordinary step. decided trot and spirited. Tracts of gallop. Well-adherent to the body in each region, thin, with poor subcutaneous cellular tissue. It must not form wrinkles. The pigment of the mucous membranes and serous leaves from light brown to dark brown or very dark, equally for carpal, digital and plantar bearings. Hair with woolly texture, semi-rough on the surface, with a very narrow curl, arched ring, with evident undercoat. Never interwoven to form cords or ringlets. The curl must be evenly distributed throughout the body, except on the head where the hedgehog tends to open. Mustacchi, beard and eyebrows well supplied. Even the cheeks are covered with thick fur. The covering hairs and especially the undercoat are water repellent. Since the fur, if not cut, tends to felting, it is necessary at least one complete shearing per year, in addition to the periodic elimination of the fur and the felted undercoat. Colour: uncoloured dirty white, white with brown or orange stains, brown roan, uncoloured brown (in different shades), uncoloured orange. In Some subjects there is a brown mask or a dark head. Any deviation from the characteristics indicated in the description of each region constitutes a defect which in the judgement must be penalized in relation to its seriousness and diffusion. Eliminatory defects: Convergence of cranio-facial axes, concave nasal cane, accentuated and disfiguring prognathism, partial depigmentation, bilateral strabismus, uncurled or sheared hair at zero, black or piebald mantle, presence of spurs, tail Amputated, height at the withers above or below the prescribed limits. Disqualification defects: enognathism, Monorchidism, cryptorchidism, total depigmentation, Gazebos eye.